GWCT News & Advisory: Time for a gritting holiday? 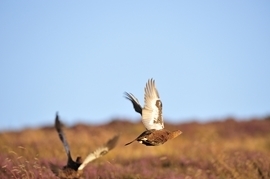 Medicated grit, developed through GWCT research, has led to a “golden age of grouse”, giving even lean years a population rivalling the best of the ‘boom and bust’ cycles. It’s been an unqualified success. But as tempting as it might be to keep up the gritting regimens that have delivered worm burdens of zero, taking a year off from gritting can safeguard the future of your grouse. Research has shown that parasitic worms in livestock can develop resistance to drugs in 3-5 years; with a short generation time, low and frequent drug doses, and high prevalence, strongyle worms tick all the boxes that suggest resistance is likely to happen. A gritting holiday makes it less likely for worms to develop resistance, avoiding the huge cost and productivity implications that resistant strains will cause. When resistance develops, our current drugs become increasingly useless and the battle is already lost. Our scientists have been working with several moors since 2011 to test the impact of gritting holidays. These early studies have shown that they can maintain low worm burdens while minimising the risk of resistance. Grouse Technical Services aim to address issues affecting grouse productivity on a long-term basis, and there’s arguably no issue that better exemplifies poor practice putting short-term gain ahead of long-term sustainability than overuse of worming medication. We perform worm counts as one aspect of our services and can help to develop your medicated grit strategy, bringing expert advice backed up by the latest research.